Kurlee Belle: Terri's Summer Hair Care Regimen: MOISTURE! MOISTURE! Terri's Summer Hair Care Regimen: MOISTURE! MOISTURE! Hello Kurlees! Recently, I've been getting a lot of comments and questions about my hair care regimen, so I thought I'd share. I have adopted a special hair care regimen for the summer because as seasons change so do the needs of our tresses. The summer heat can leave our hair dry and fried. To counteract its effects, it is important to keep the hair moisturized from root to tip. Here is a snap shot of what I did last week which is labelled Week 1. In the above photo, I am wearing mini twists which I have pinned up in the back for a classic updo look. Follow me on Instagram (@terrinique) to track my progress and see fun photos of the beautiful Bahamas and natural hair! I start the week off with a deep treatment. Apply satin bonnet cap for short hair tying with a satin scarf and applying a bonnet works best to avoid bends in your twist. Another option would be to create bantu knots for a curly look. Bantu knots take long to dry so, you may need to sit up the dryer before knotting the hair. After mini twists are dry. In addition to my hair care regimen, I am taking biotin capsules (one pill a day with meal). They are made by Nature Made (Liquid Softgel Biotin). Biotin aids in healthy hair, skin and nails. Additional info: I dry my hair with a soft t-shirt that is 96% cotton, 4% spandex. This reduces friction and frizz. Daily: Spray hair with bottle water for moisture and oil..Retwist front hair as necessary. The front of my hair is the only part that is not pinned up. Please let me know if you have any questions. If you would like to join in my hair care regimen, please let me know! It's always fun when naturals do stuff together. I love your mini twist! I really want to do this for the weekend because I'm going to the beach and this HUMID weather is killing me! Thanks for your comment. This style is perfect for the beach. The twists will not puff out and they fit comfortably under a straw hat! 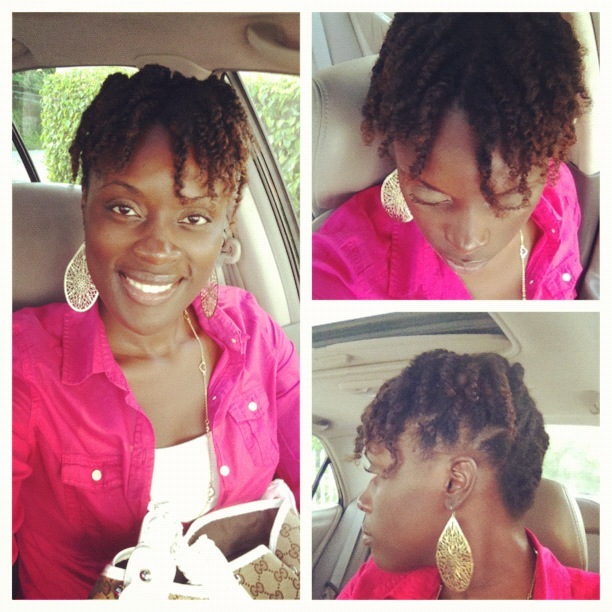 I can't wait to try this when I take out my current protective style thank you sharing! Thank you for your comment Charnele! Let me know how it comes out. where can i order the leave in conditioner? Kurlee Fashion Frenzy: Peplum Everything! Mad Hair Monday Model: Barbie of Chichappenz! Mad Hair Monday Model: Lauren of LaCocoBella! Hair Chalking: Will you try it? Mad Hair Monday: Vacation in the SUN!